The Scarpa Rebel Ultra GTX are Scarpa's lightest B3-rated ice / mixed climbing and mountaineering boots. We have tested these boots over multiple seasons from the French Alps in summer to the depths of the Scottish winter. Safe to say, we were impressed but found that the flawless technical performance was offset by some minor compromises elsewhere. 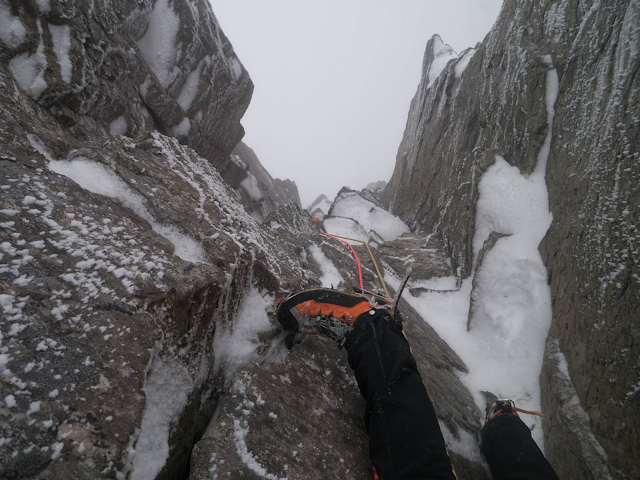 Paired with a set of lightweight mono-point crampons (e.g. Petzl Dart, Grivel G20, etc.) these boots are a marvel to climb in. Weighing in at around 1.5kg per pair (in size 41 on our scales), you will barely notice them on your feet compared to tried and tested heavyweights like La Sportiva's Nepal Extreme. 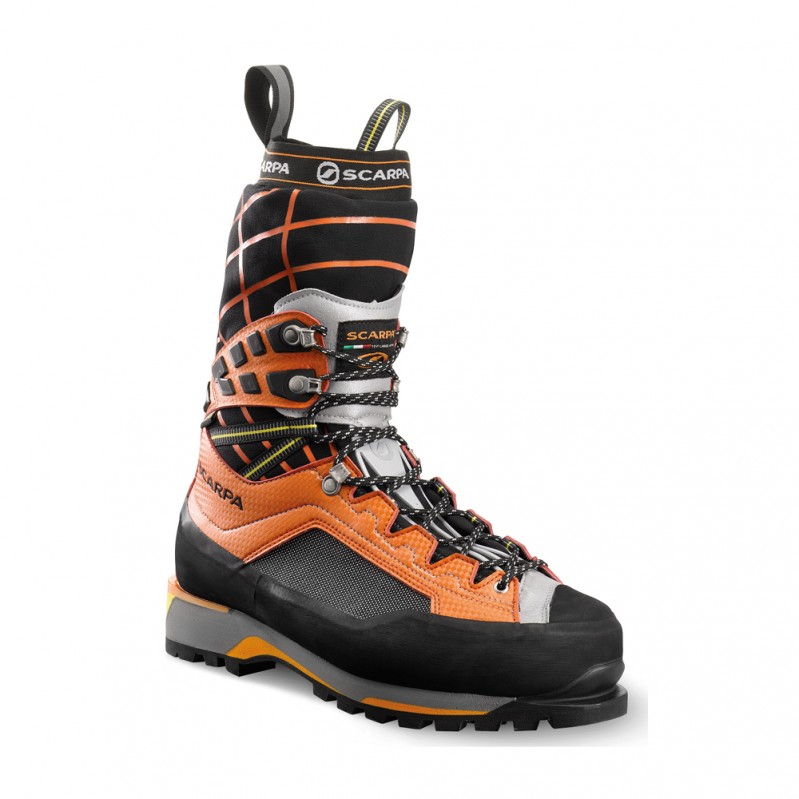 In addition, Scarpa have designed the unique ankle closure on the boots ("Flex Point System") to allow unprecedented freedom of movement in a mountain boot of this class. This allows the boot to climb with the precision of a fruitboot which our tester found to have a tangible positive effect on footwork on steep terrain. In other words, they actually make you climb better! But what about performance on more moderate ground? The Scarpa Rebel Ultra GTX are a pleasure to wear on a long approach, fitting more like a snug trail shoe than a clunky mountain boot largely due to Scarpa's lauded Sock Fit technology (implemented throughout their range). However, the lightweight precision of the Rebels comes with some compromises. In particular, the profile of the boot is noticeably narrow compared to more mountaineering orientated boots (e.g. La Sportiva Nepal Extreme, Scarpa Mont Blanc Pro, etc.). Whilst this can be a benefit stuffing the boots into cracks on steep ground, it does give the boots slightly less stability on rough trails, loose scree and the like, especially, combined with the high platform at the foundation of the boot. This is worth bearing in mind for users with a history of ankle problems. Also, the lugs on the sole aren't as deep as the examples noted above which could affect grip and long term durability – although our tester's pair lasted 3 full seasons of regular use with only one durability issue, a snapped lace eyelet (although Scarpa replaced the defective pair free of charge despite being outside the warranty term – thanks Scarpa!). It is worth noting that Scarpa have bulked out the soles a little since the original model which should have a positive impact on durability. Finally, the most frequently asked question we receive about the Rebels is, are they warm enough? Our tester found them to be a good compromise for 3-4 season use in temperatures ranging from the –5C to +10C. In other words, ideal for Scottish winters and alpine summers but possibly look elsewhere for a true cold weather boot (e.g. La Sportiva Spantik, Scarpa Phantom 6000, etc). Things we like: Flawless climbing performance, comfort, Scarpa's customer service. Things we don't like: Ankle protection and stability, pricey (but you get what you pay for). Awesome blog sharing for hiking boats. Rebel Ultra GTX is really essential for your hiking. It strong and best quality leather.